Rugged 600-denier polyester bags have two mesh side pouches and outside zip pocket. Carry two ways—using handles with comfy grip or detachable, adjustable shoulder strap. Wipe clean with damp cloth. Imported. Specify up to 12 characters for embroidered name. Made-to-last rolling luggage is now crafted of sturdy, double-stitched, wipe-clean, 600-denier, PVC-backed polyester. Quality constructed bag features, a cushy padded back, durable smooth-rolling plastic wheels, comfort-wrapped webbed handle, and zip pockets. Bottom of the rollers to the top of the luggage measures 18”, bottom of the rollers to the top of the closed handle is 20”. Handle extended gives an overall height of 34". Length is 12” and width is 5 1/2”. 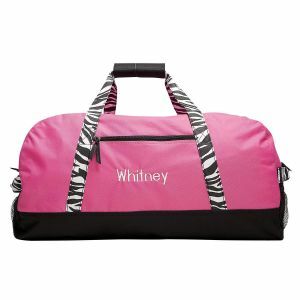 For embroidered name, specify up to 12 characters. A little wild with a whole lot of function and not available anywhere else! 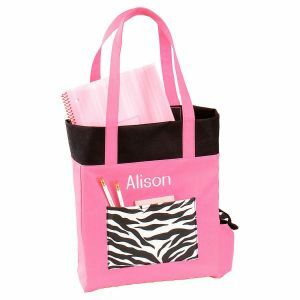 Tote bag is quality constructed of rugged PVC-backed 600-denier dense polyester; feature embroidered name. 4" x 11" x 13"H and has open top, front patch pocket, and side pocket with self-stick closure. 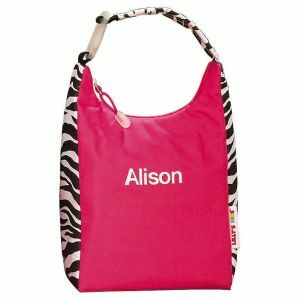 Includes zippered 3-1/2" x 6" pouch with 4-1/2"L wrist strap. 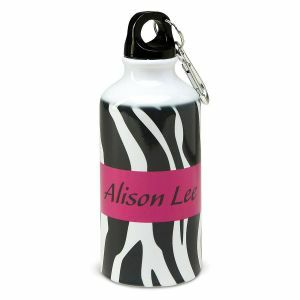 Wild design - not available anywhere else! 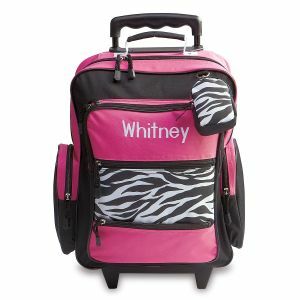 Personalized quality constructed of rugged PVC-backed 600-denier dense polyester. 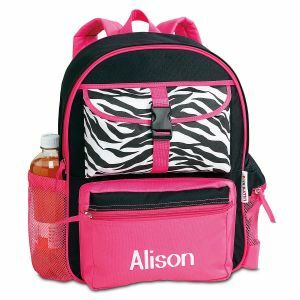 Front & side pockets; buckled, zip, & elasticized closures. 5" x 10" x 15"H. 14-oz. ; aluminum; about 2-1/2" diameter, 6-3/4"H, including plastic screw-off top with attached clip. Hand wash.